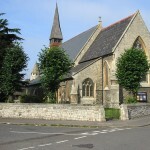 S. Andrew’s (located on the corner of St. Andrews Road and Queen Street) offers a full programme of worship throughout the year. There is a Low Mass on Thursday at 9.30am. Our 10.30am Parish Mass on Sunday is a blend of traditional and modern with altar servers, incense, hymns and a sermon and appeals to individuals and families alike and lasts about 75 minutes – longer if there is a Baptism which often occurs on the first Sunday of the month. You may like to take a look at a video of St. Andrews. Our Sunday School also meets at 10.30am in the Parish Centre and join with us for Holy Communion. Congregations vary from 60 to 100 or more. Some have been coming for many years; others are exploring faith. All are made welcome. Music is a mixture of traditional and modern and the celebration is symbolically rich. Most who come realise they are on a journey of discovery and exploration aided by the Liturgy. For further information, please contact the Rector.